Below you will find projected finish times for each of Mocorunning's ranked runners as of Week 7 (10/15/2017). Scroll to the bottom to read how the projected times were determined. Mocorunning's Ranking Formula is explained HERE. The ranking formula compares runners in every race throughout the season and year after year. The finish times only matter to the extent that finish times of all ranked runners will be compared and scored against all other ranked runners in that race. After a meet is scored, there is a point exchange among the ranked runners. One of the important things to know is that there is no reward for running "fast times" and no penalty for running "slow times." In other words there is absolutely no benefit to running a fast course like the DCXC course compared to a difficult course like Watkins Mill. The most important thing for mobility within the ranking is beating other ranked runners by as many seconds as possible. The ranking you see on this page exactly matches the names on the week 7 ranking published on 10/15/2017 with a couple notable changes. Private school runners were removed and the points were replaced with projected finish times for the county championship course at Gaithersburg. Do the points convert directly to 5k times? No, not exactly, but the points do convert to a time scale. 1 second = 2 points. Therefore, if the top ranked runner had 200 points, he or she would be ranked 200 points or 100 seconds above the cutoff to make the ranking. You can assign that top ranked runner any 5k time, and he or she would be 100 seconds (1:40) above the cutoff to make the ranking. Take any two runners and subtract their point totals, divide by two, and you will know how far apart they are "supposed" to finish according to the ranking. To assign the projected times to all the runners, you really only need to assign a projected time to one runner. Once one runner has an assigned projected time, the point scale dictates the finish times for every other runner within the ranking. It's not the first or last ranked runner that you want to key off of. It's the runners in the middle range that will be the most consistent year after year. The great thing about the county championship is that we have the same exact number of teams entered in the meet at the same time of the year, every year. Weather is also a factor, but we have had great weather at the county meet for the last several years. The caliber of the middle tier varsity runners will not fluctuate very much from year to year. 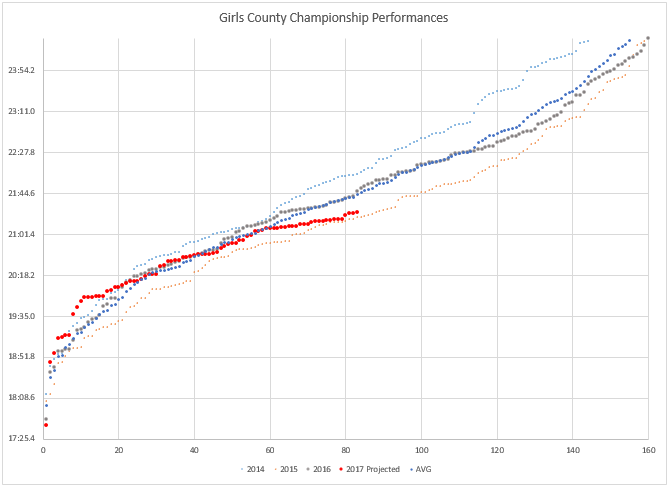 The chart below shows the county championship varsity race plotted for each of the last three years plus a line showing the average finish time between those three years. 2015 was far and away the fastest race in history and it had to do with the race being run on a Monday afternoon on a beautiful day with dry weather leading up to it. I am guessing that not every year will be the fastest year ever and we will regress back towards a more typical year like 2014 and 2016. Under the assumption that 2017 will be an average year, meaning that this year's top 100 varsity high school runners are no better or worse than a typical year, I want my RED projected line to land on the blue AVG line as closely as possible. I can't manipulate the curvature of the red line. The curvature of the red line is dictated by the ranking/points system. I can only move my red line up or down vertically which I did until I felt that I had the best overlay. Doing this exercise ensured that the projections are in line with the history of the meet on this course.